Happy New Year! New Year’s Eve is tonight. Are you and your pets ready? If you’re having a party at your house, consider safely containing even the most social party animal for his and her safety. You may think your pets seem happy, but cats, dogs and other pets are excellent at hiding stress (a survival instinct). Make a quiet party for your pets in a separate room with their favorite music, toys, and if you can’t lock it, a sign on the door reminding guests not to enter. Going out? Our tips can still help your pets ring the new year in with style. Read on for our NYE countdown of tips for you and your pets. Parties mean doors getting opened a lot. Even if you’ve thoughtfully hung a sign on your bedroom door saying do not open, or if you have your pets safely contained in a crate inside the bedroom (wearing safety breakaway collars only in a crate), accidents happen. Make sure your pet ID tags and microchip information has your current address and phone numbers. For dogs and even cats, giving them plenty of exercise on New Year’s Eve day will help them to rest more peacefully that night. Plus a good long walk or hike with your dog will help you burn off those extra holiday calories too! If your pet is going to be out loose in your home during a party, make sure every single guest agrees NO HUMAN FOOD FOR PETS. The #1 reason pet owners end up at the emergency vet on New Year’s Eve or New Year’s Day is because a pet is sick from too much people food, or the wrong people food. Even human foods you think are “safe” for pets can cause pancreatisis, which can be fatal. 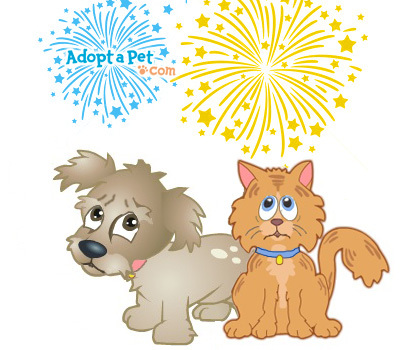 Loud music and fireworks can upset even the calmest of pets. If you don’t have a white noise machine, putting classical music on where the pet can hear it can help cover up outside upsetting noises. If you have an anxious sound-sensitive dog, many pet owners find relief using a Thundershirt pet wrap, available at most pet supply stores.